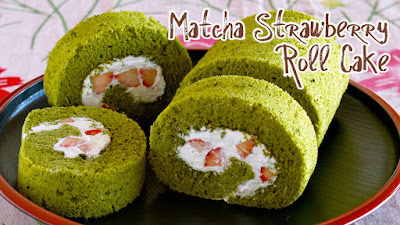 By using cocoa powder instead of Matcha powder, you can make chocolate strawberry roll cake!!! 3. Sift in cake flour and Matcha powder, half at a time, and mix on low speed with an electric mixer for a minute or two in total until just combined. 8. Meanwhile, combine whipping cream and granulated sugar in a dry, clean bowl. Float the bottom of the bowl in ice water, whisk the cream until firm peaks form. 10. 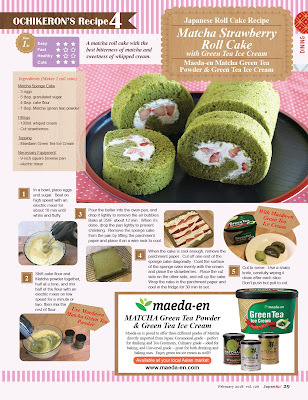 Coat the surface of the sponge cake evenly with the cream and place the strawberries. Place the cut side on the other side, and roll up the cake. Wrap the cake in the parchment paper and cool in the fridge for 30 minutes to set. 11. Cut to serve. Use a sharp knife, carefully wiping it clean after each slice. Don't push but pull to cut.